Burford is a small town on the River Windrush in the Cotswold hills. The name derives from the Old English words burh meaning fortified town or hilltown and ford, the crossing of a river. With its medieval bridge, old stone houses and attractive Tudor and Georgian frontages, Burford is justifiably called one of the most picturesque towns in England. 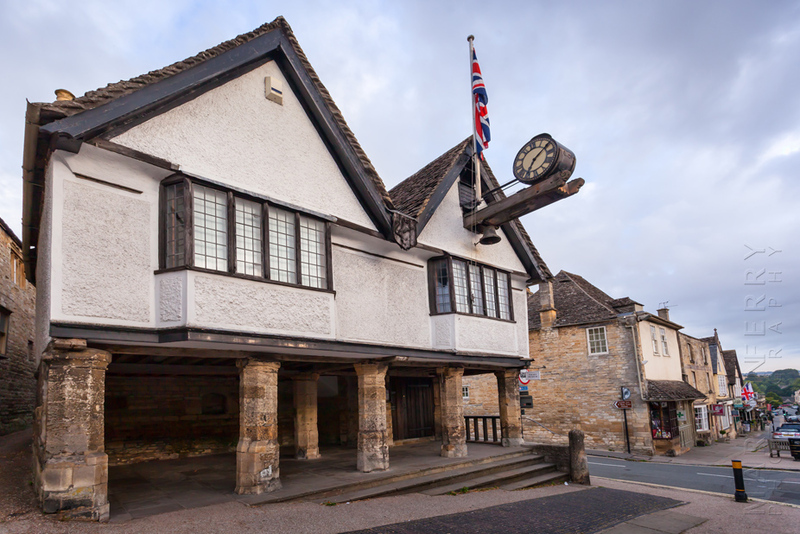 Often referred to as the ‘Gateway to the Cotswolds’, the town was originally a fortified Anglo-Saxon ford, which continued in use until just after the Norman conquest of England, when the town of Burford was built on its current site. Looking towards the town set among the Cotswold countryside, the high street is on the right of the picture. The first certain reference to Burford is in the Domesday Book of 1086. Around 1090, during the reign of William Rufus, Burford was granted a Charter. This was one of the earliest Charters in the country and gave the men of Burford various rights - to hold a market, rent out their property and sell or bequeath leases as suited them; and it removed them from the ancient feudal system. Despite its modest size, Burford has remained a town for over nine hundred years. A view along a section of the High Street. The market, and therefore the town, developed over the centuries to incorporate all the local industries. From sheep farming came wool, the mills, the weavers, tanners and, at one time, the best saddle-makers in Europe. From agriculture came the flourmill, while local stone produced stonemasons and builders. And to wet all those thirsty throats was the brewery, which, together with the annual fairs and the race course, once made Burford one of the four wealthiest towns in the county. One of the many 16th century inns that dot the main road through the town. Burford’s geographical position on a major north/south and east/west crossroads made sure it was an important coaching centre – at one time over 40 coaches a day passed through, stopping at one of the many inns. A situation that continues to this day, as through the summer months the town is practically gridlocked with coaches, although they're not horse drawn anymore. Set on the sloping High Street, this historic building now houses a tea room. Chroniclers record a battle between the West Saxons and Mercians at Burford in AD 752, with the Mercian standard-bearer carrying a flag with a golden dragon on it. In the late 16th and early 17th century the people of Burford still celebrated the anniversary of the battle. One Chronicler wrote: "There has been a custom in the town of making a great dragon yearly, and carrying it up and down the streets in great jollity on St John's Eve". The field traditionally claimed to be that of the battle is still today called Battle Edge. The Tolsey, the town's museum, is an early Tudor building on stone pillars. Between the 14th and 17th centuries Burford was important for its wool, and Wool Merchants would meet in the open space underneath the building and conduct their trading transactions. St John's benefited from the rich wool and cloth merchants of the area, who, rather than getting together and building a spectacular church, as happened in other places, slowly added pieces as they desired. This gives it a bit of a maze-like feel inside, with multiple chapels, shrines and alters, but also endows it with a certain charm. In 1649, the church was used as a prison during the Civil War, when the Banbury faction of the New Model Army, also known as the Levellers, were held there. Some of the 340 prisoners left carvings and graffiti, which still survive in the church, one of them even carved his name into the font, which says "Anthony Sedley 1649 Prisner". On 17 May three soldiers who were accused of being the ringleaders were executed on Oliver Cromwell’s orders in the churchyard. The bullet holes are still visible in the church's wall. The tomb was erected for Sir Tanfield in the early 17th century by his widow, despite being refused permission to do so by the church. Lady Tanfield just sent her workmen in anyway to build it. Sir Lawrence was Lord of the Manor in Burford, and Chief Baron of the Exchequer to Elizabeth I. He was reviled locally for his high-handed interference in local affairs, and had a reputation for greed and corrupt practices. Local legend tells of a fiery coach containing Sir Lawrence and his wife flying around the town and bringing a curse upon all who see it. The apparition may have been caused by a local tradition of burning effigies of the unpopular couple that began after their deaths. The visitations were reportedly ended when local clergymen trapped Lady Tanfield's ghost in a corked glass bottle during an exorcism and cast it into the River Windrush. During droughts locals would fill the river from buckets to ensure that the bottle did not rise above the surface and free the dreadful spirits. Looking along the main aisle of the church towards the altar. 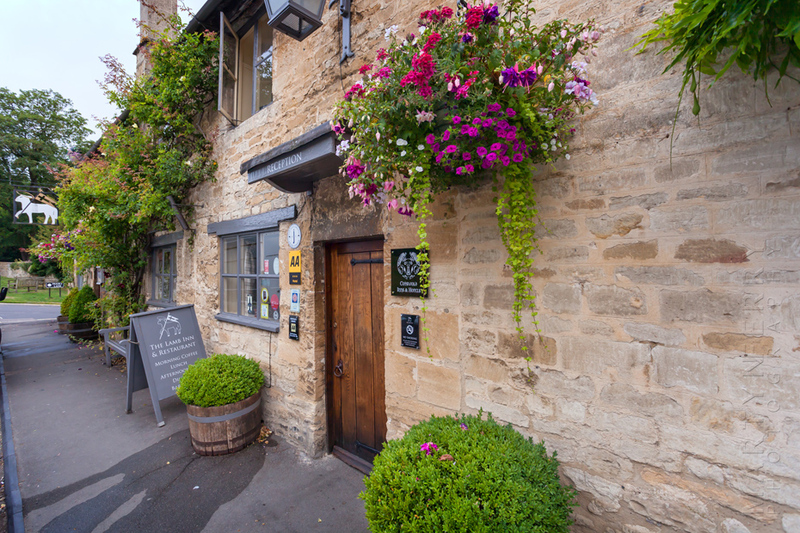 Burford is home to a multitude of historic inns, which still do as good a business today as they ever did. On Sheep Street, a collection of former weavers' cottages provides the setting for the Lamb Inn, which has been a there since 1718. Situated right next to the Lamb Inn, the 16th century Bay Tree Hotel is also made up from a row of ancient houses, including the Courthouse. The hotel was purchased in 1935 and opened as a country hotel where only young ladies worked, making it a very regular stop for the gentlemen of the area. In the mid 18th century, post coaches rattled down Burford High Street every day and many would overnight at the Bull, which still has the courtyard, coach house and stables to prove it. The hotel also has a room called the Trafalgar, where Nelson and Lady Hamilton slept. If all that activity, albeit from previous centuries has worn you out, never fear. From bustling to decidedly un-bustling, our next stop is to the sleepy and incredibly charming village of Swinbrook, one of my favourite places in the Oxfordshire Cotswolds.